Your hub for InitLive news, product updates & more! If you've enjoyed having insight into your staff's availability in relation to each of your events, you're also going to love that you can now collect what days and times they are generally available for. So, the next time you need to find staff who are available on Tuesdays & Fridays, you'll be all set! The following InitLive feature updates bring greater sophistication in availability collection, more automation, and more self-serve options for volunteers. Check it out! InitLive's new general availability settings allow you to prompt your volunteers to block off weekdays and hours when they would be available or unavailable to work. Volunteers can also set exceptions for specific dates. For example, you may have a volunteer who knows that they are available on Tuesdays or Fridays between 7AM and 7PM; however, Friday, May 24th, is an exception as they won't be available. All of this information can be easily set by volunteers using InitLive's drag and drop interface. Event Manager Perspective: When the availability function is toggled 'on', it is applied at the Organization level of your InitLive account, meaning that you can conveniently collect availability from your entire staff list, regardless of how many events you're running. Once collected, the availability of your staff automatically gets passed down to every event schedule you create, helping you to minimize the number of times you ask for availability and to have immediate visibility for scheduling quickly. 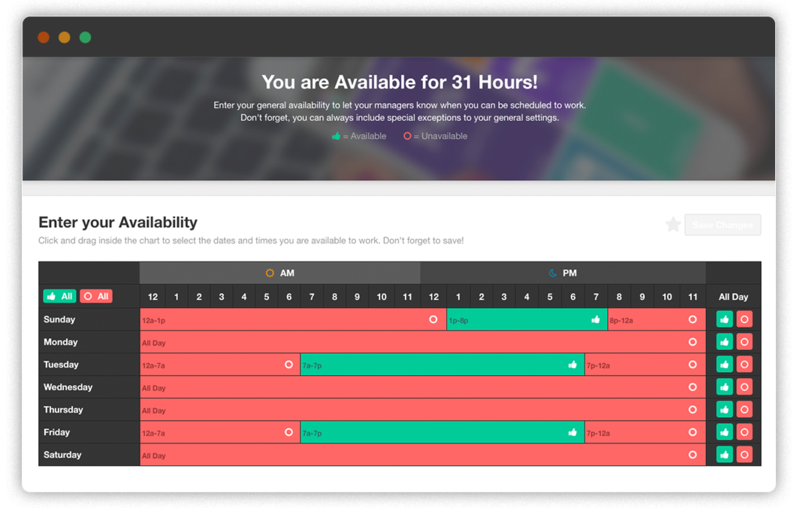 To make scheduling as simple as possible, you can filter staff based on their availability. This takes the guesswork out of who to schedule and when, while also minimizing the need for scheduling revisions. While clocking-in to a shift may be fairly intuitive for volunteers, it can be tricky to have them remember to clock-out after their shifts are complete. To have more control over how to track volunteer hours worked if no clock-out activity happens, you can set InitLive to automatically clock-out shifts after shift end times. Do you have volunteers coming and going throughout the day who you want to keep track of - with no administrator supervision or mobile app required? No problem! 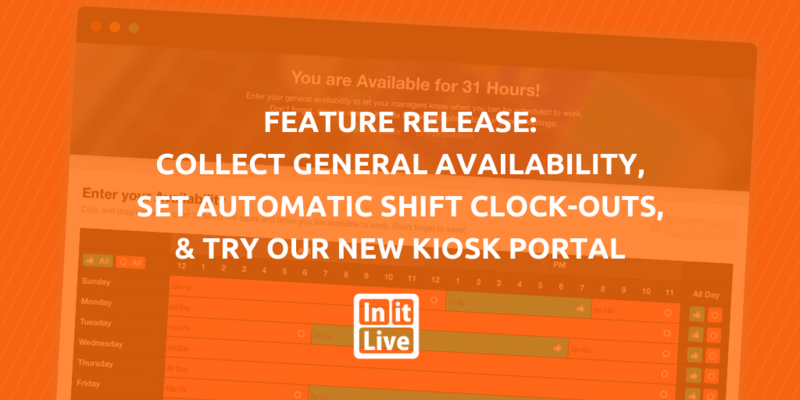 You can now set up a self-serve "kiosk" process for volunteers to clock-in/out to their shifts. This new feature can be set up to access via the web app or, for greater control, you can install the kiosk portal software directly to your desktop - compatible with all operating systems. Ready to give these features a try? Log in here, or watch a demo to see how InitLive will help you implement a seamless recruitment and scheduling experience! Don't forget to subscribe to our blog for regular updates relating to event planning and volunteer management. Putting together a thorough event staffing schedule is not only crucial to your event's success, but also a lot of work! This means having ways to ensure that you roster all of your shifts with qualified staff, who you can be confident will show up, is essential. That's why we're excited to announce 3 new feature sets that will help you do just that! Concerned about staff and volunteers forgetting which shifts they signed up for? Or maybe you're afraid that you'll forget to send them schedule reminders? It's possible - after all, you do have a lot going on. Using InitLive, you can now pre-schedule personal schedule reminder emails to all of your staff or filtered staff lists - keeping staff in the loop, preventing no-shows, and automating an otherwise tedious task. Within the body of these emails, you can choose to embed a formatted chart-view of the volunteer's personal schedule. 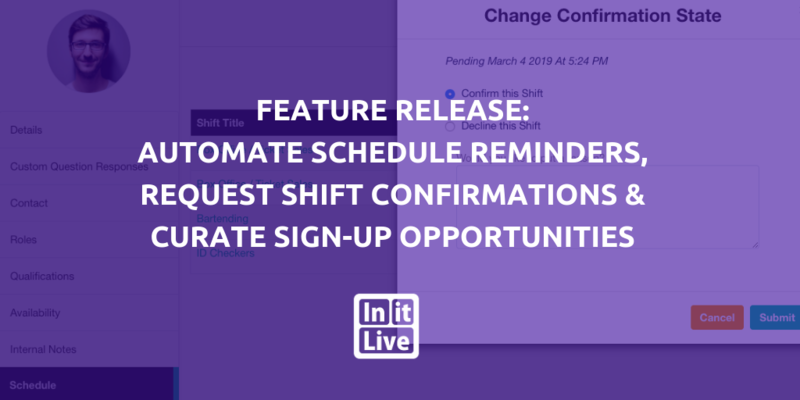 Or, if you know that you'll still be making quite a few changes to the schedule, you can simply send out the reminder email with a link to log into the InitLive system to view their current shift schedule. InitLive allows you to proactively plan out how often you want to remind your staff and at what times leading up to your event. For example, schedule 3 reminders to go out to your staff before the event starts: 1 month before, 2 weeks before, and 1 day before the event. Running several events? No problem! From the Organization level, you can set up schedule reminders across multiple events too. In just a few clicks, set a multiple reminders across 4 of your warrior dash races. While there's a tremendous amount of planning that goes into ensuring that every event day is a success, there is also a high level of faith that event managers need to have over everything actually going according to plan - this includes trusting that volunteers will show up. To help develop transparency between event managers and volunteers and their ability to attend, we've created a Shift Confirmation process. Emails: From one event or across multiple events, send out shift confirmation emails to your staff to request them to confirm or decline their assigned shifts. If a staff member declines a shift, they will be asked for a reason why. 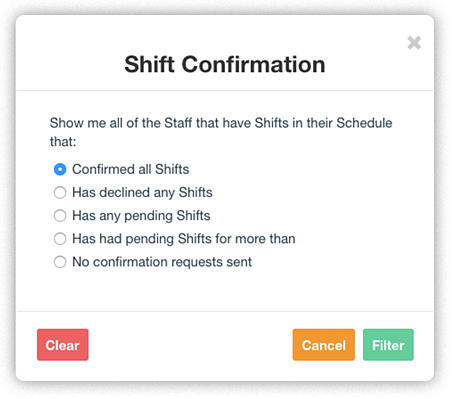 Confirmation Visibility: To stay informed as staff confirm or decline shifts, you can turn on email and/or bell notifications OR you can filter your staff list based on confirmation states (see which staff have confirmed all shifts, declined any shifts, has any pending shifts, or has no confirmation requests sent). You will also be able to review the reasons behind any declined shifts and can pull a report for this. Automation: Should staff decline a shift, you also have the option for the system to automatically remove the user from that shift, making room for someone else to fill it. This is a great way to automate a repetitive step (so long as reviewing the reason why the user declined the shift isn't important to you). Manual Override: In the case that staff and volunteers email you or phone you to communicate if they can or cannot attend, you, as the event manager, have the ability to change their confirmation status on their behalf. For Organizations running many events, you may not want your entire staff list to see, and potentially signup for, all of them - particularly if any of the events require staff and volunteers with specific qualifications. 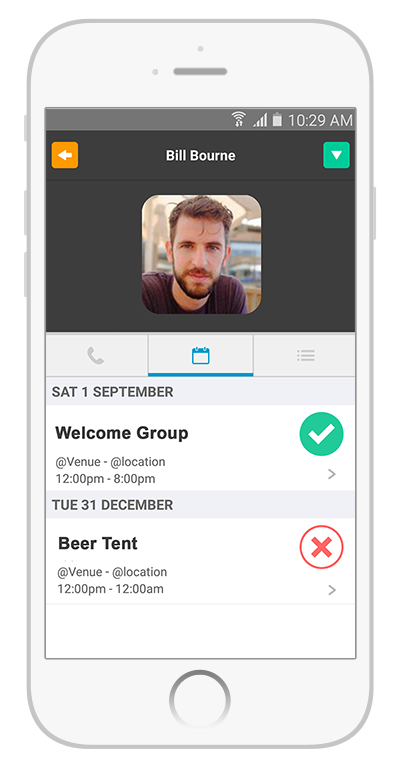 To avoid showing Event Listings to unqualified staff, we've created what we call Logic Groups! What is a Logic Group? 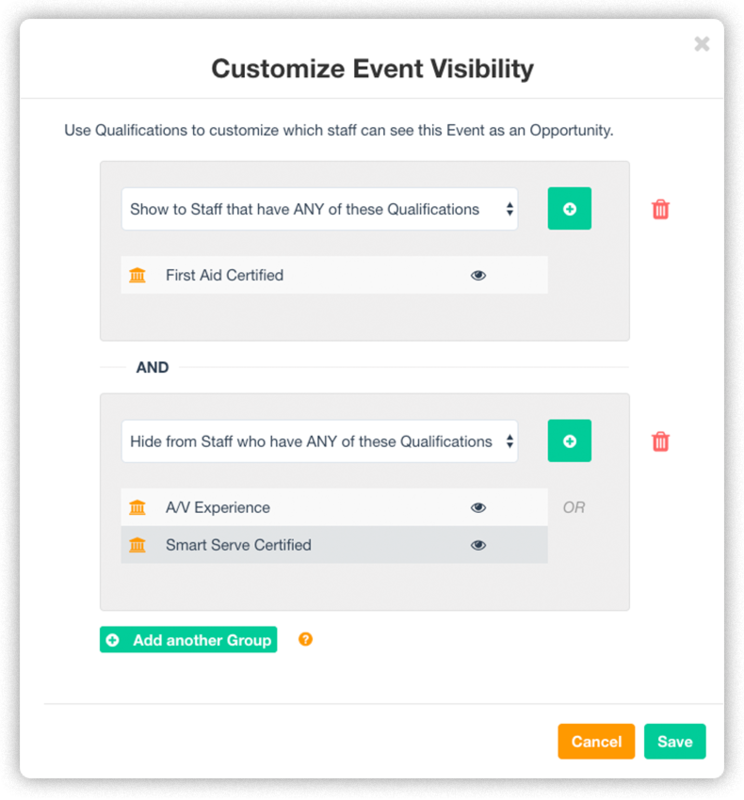 : A set of criteria based on qualifications that you can customize (using AND / OR functions) to affect your Event Listing's visibility to certain staff. For example, set your First-Aid event listings so that only the staff with First Aid qualifications can see them. Confirm Which Staff Can See Specific Event Listings: From the Organization level, filter your staff list by 'Event Visibility' to see which staff can or cannot see specific event listings. For example, maybe you want to double check that Kelsey cannot see the Fireworks Event, because you know she has PTSD. Event managers can now enable a new step within the volunteer registration process to collect staff availability. Better yet, managers can configure their availability module with custom titles and time blocks that suit their event schedule. For example, a manager can create a 'Morning' time block from 5am-10am, an 'Afternoon' time block from 10am-2pm, and an 'Evening' time block from 2pm-6pm. Have time blocks that look completely different from those? No problem - managers can set them to any time frame they want, even over midnight. Staff will then be able to select their availability across all time blocks that exist within the event schedule. 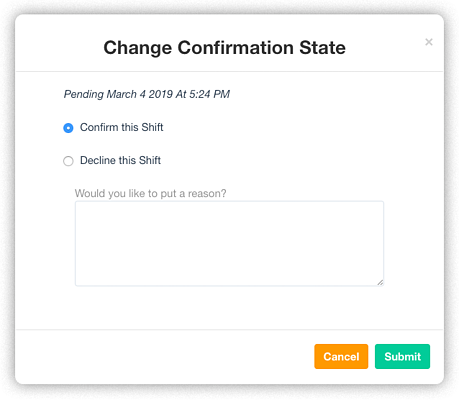 What Staff See: This new signup step allows staff to select the time blocks that match when they are available to work via an intuitive drag and drop module. For example, a volunteer could select that they are available from 2pm-6pm across each day of a 5-day festival. 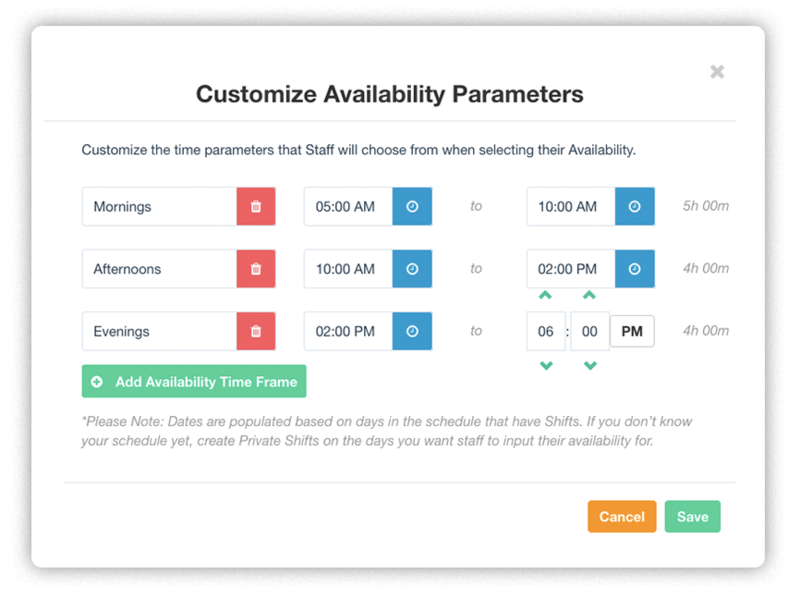 Collecting availability is ideal for managers who want to manually schedule their staff, allowing them to make faster, and better scheduling decisions. Once Event Managers collect availability from their staff, they can filter their staff list based on availability (ie. find everyone who indicated that they are available to work a morning shift on the Tuesday of the event). From this filtered list, managers can apply multiple actions (ie. send a message, add to a role, remove qualifications, etc. 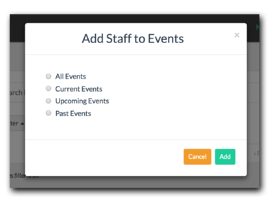 ).InitLive helps Event Managers make smarter scheduling decisions as they build out their shifts: while creating shifts for the event, see and pick from a list of all staff who are available for that shift. InitLive provides visibility to both Managers and Staff when there is a conflict between the time someone is marked as available and the time of a shift. This flag notification helps Managers prevent scheduling errors while manually scheduling staff. 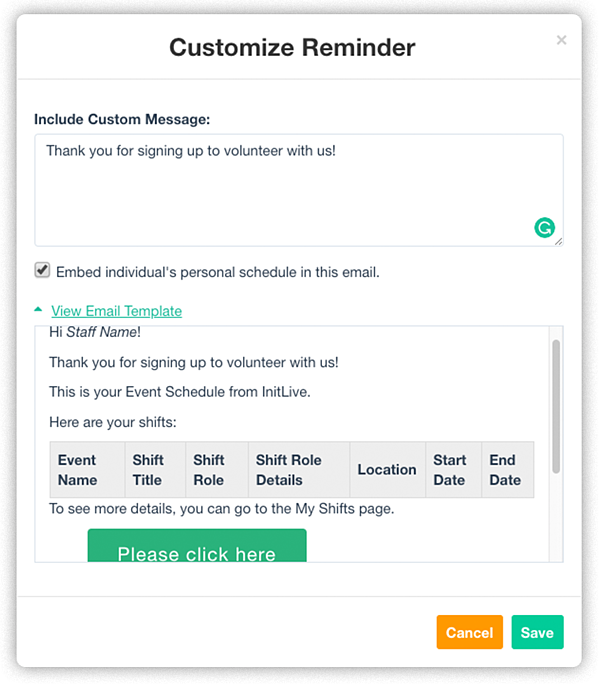 For Event Managers who enable self signup for their volunteers, the system will feature the shifts that staff are available for, but will also notify them should they try to select shifts that don't align with their availability. Ready to give these features a try? Log in here, or watch a demo to see how InitLive will help you track your staff and volunteer availability like never before! When managing a large database of event staff & volunteers, visibility is key. Whether you're looking to: organize your staff database by skills & qualifications, search for under-scheduled staff, ensure all staff are attending their shifts, or further customize your chain-of-command, these 4 big updates make managing and tracking all of this information a breeze. We’re excited to announce that you can now use qualifications to manage your staff database at the Organization-level within InitLive. Think of them as customizable tags or labels you can create and assign to staff as needed. You might be familiar with qualifications from using them to identify the skills, attributes (i.e. age range), and certifications of staff working at each of your events. 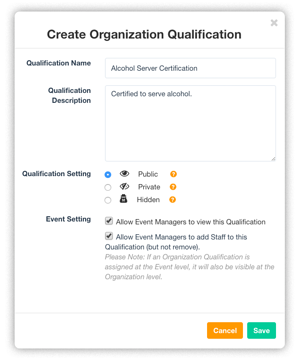 Now, you can create qualifications for your staff not only at the Event level, but at the Organization level too. ‘Organization Qualifications’ help you keep data consistent across multiple events by allowing you to collect staff information once and then transfer it down to the Event level. Pro Tip: Try using Qualifications at the Organization-level as a way to categorize and manage staff. For staff members who possess a variety of skills, add as many qualifications as you like. 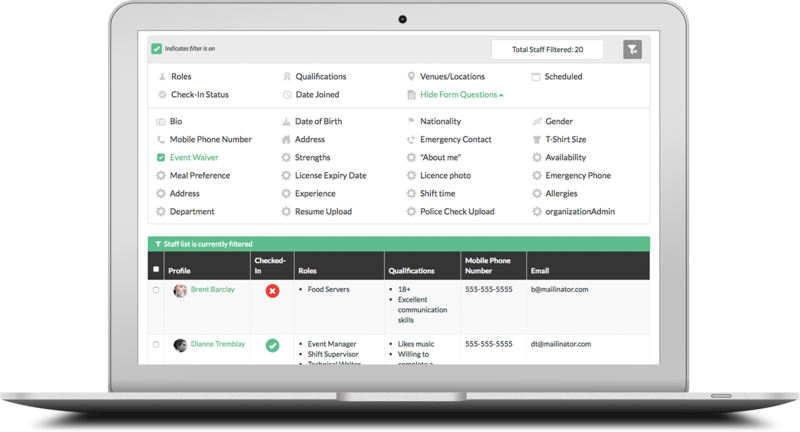 The more information you have in InitLive, the easier it is to schedule qualified staff to the right events and the right roles. Stay tuned—soon, you’ll even be able to connect Qualifications to sign-up opportunities so that staff will only be able to see new opportunities that they’re qualified for. A big part of optimizing your staff schedule is ensuring that you’ve leveraged the full potential of each of your volunteers. However, this gets challenging to track when you’re working with a large number of staff. 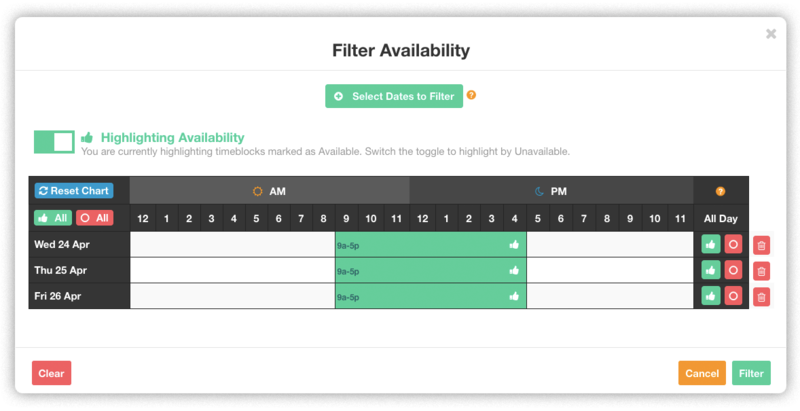 That’s why we’re introducing Schedule-based filtering - a brand new way to assist you in finding staff based on attributes from your schedule. Choose to filter your staff list based on people who are currently scheduled in shifts; people scheduled for more or less than a certain number of shifts; or by people who are scheduled for more or less than a certain number of hours. Pro Tip: Try using Schedule-based Filters to add hours to staff who have been under-scheduled. For example, filter your staff list to show you everyone who is scheduled for less than 1 hour, on Monday, in the Life Guard Role. After you’ve applied filters to find the staff you’re looking for, add to or edit their schedule however you like! Ensuring that volunteers show up at the right place, right time, according to how they've been scheduled, is crucial to the success of any event. Visibility over your staff attendance helps you hold staff accountable and to fill in schedule gaps should staff not show up - so that no shift ever goes unfilled. InitLive now offers 2 ways to track the attendance of your staff and volunteers! Track overall event attendance (the original way) or track attendance at the schedule level with InitLive’s ‘Shift Clock-ins’ (the new way). Event Attendance: Track staff attendance at your event via the Event Check-in feature in order to generate a high-level overview of who attended your event and who didn’t. 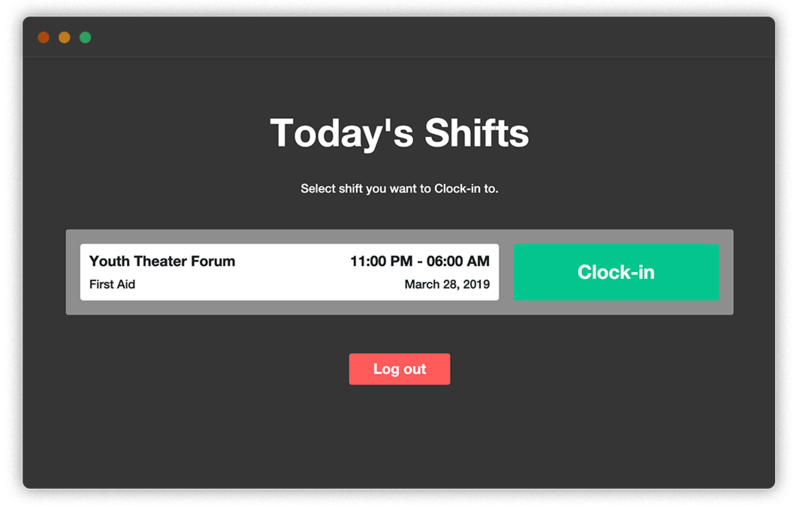 *NEW* Shift Attendance: Track attendance of individual shifts via the Shift-Clock-in feature in order to ensure all shifts are fulfilled by each of your scheduled staff. 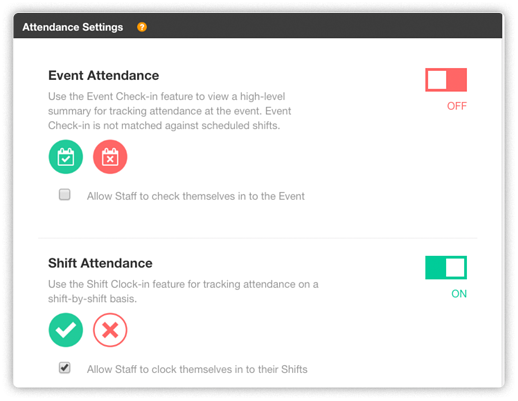 Configure your attendance settings according to your event needs. With shift attendance enabled, you’ll be able to track staff, in real-time, at a more granular level (ie. For a 5-day event, shift clock-ins will provide a much clearer view of attendance in real-time because it’s likely that not all volunteers will be scheduled for each day of your event). As your events take place, InitLive automatically records all your shift clock-in data so that, post-event, you can pull a custom report. We've designed these reports to be as flexible as possible: pull shift clock-in data by one event at a time, or pull the data across multiple events with the option to filter by a specific timeline (i.e. week/month/year). Pro Tip: Try using Shift attendance to calculate hours worked and/or pay staff. When this setting is enabled, detailed Shift clock-in/out logs and Hours worked reports will be generated. Sometimes you want to grant members of your team increased InitLive permissions for managing segments of staff at your event, but you don’t want to provide full 'Event Manager' access, risking unwanted changes to your event settings. Because of this, creating a 'Role Manager View' has become a highly requested feature. We’re excited to say it’s finally here! InitLive’s new ‘Role Manager View’ allows you to limit the Manager view by Role for a member of your team. What does this mean? When you limit an Event Manager to a Role, they will only be able to see staff who are assigned to that role, and shifts that include that role. To prevent confusion, they will also see a simplified interface that will only display the data that’s important to them. Pro Tip: Try using the 'Role Manager View' as you structure the operations for your event. 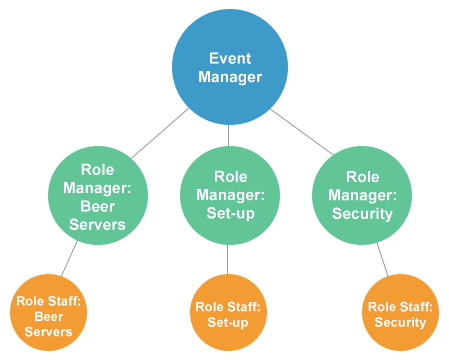 For example, if you want a Beer Tent Manager to have full control over the staff, schedule creation, and management of everyone in the Beer Tent Role, this will allow them to do that. Ready to give these features a try? Log in here, or watch a demo to see how InitLive will help you track your event staff like never before! The InitLive development team is always working hard to deliver exciting updates and today is no exception! If you're an event producer who organizes several events annually, listen up because this month's release includes features that multi-event producers will love! Build upon what you've already done! 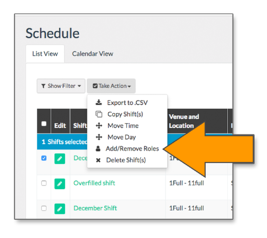 Whether you're redoing an event from last year or from last week, you can now copy previous schedules over - with the option to also carry over roles and staff! This will not only be a huge time saver, it will allow you to build out templates for different event types, recurring schedules and more! Whether your event takes place across several different cities or you're running very different events across the country, you can now filter through your Organization's staff list by location so that you can invite and schedule staff who are local to each event. It's now easier than ever to maintain consistent data collection across multiple events using Registration Form Templates at the Organization level. All Organization Managers need to do is create a form template and can quickly apply it to as many events as they like. Say "goodbye" to data duplication and "hello" to a clean database of staff information. 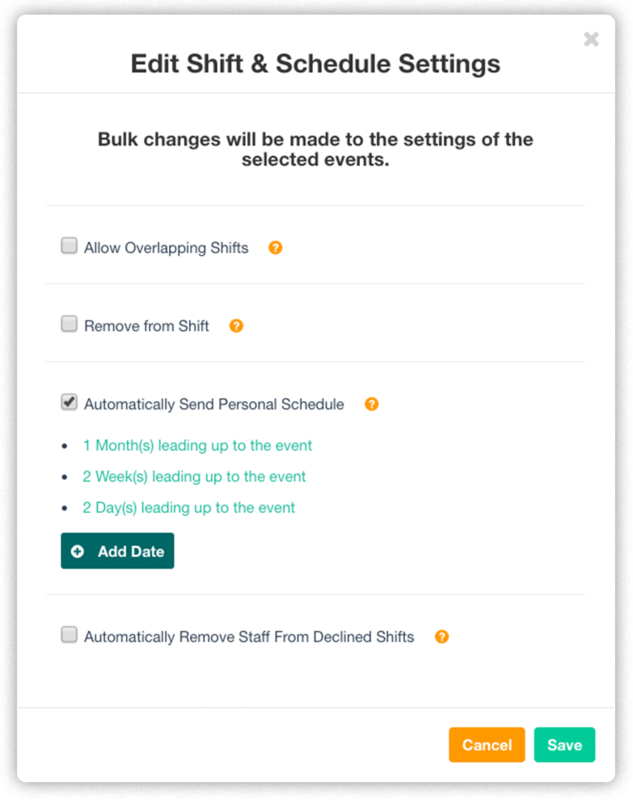 Supposing you're running 15 events this month and you want to send shift schedules to all staff and volunteers working those events...Now, from the Organization level, Managers can select staff across multiple events to have their shift schedules immediately delivered to their inbox. Event managers can now configure their events to either allow (or not allow) staff to remove themselves from an event OR from a shift. This staff permission has been updated on both the web and mobile app. What are you waiting for? 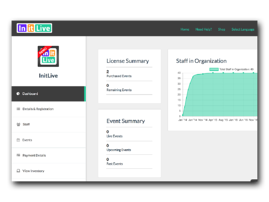 Go log in and check this new portal out, or watch a demo to see how InitLive takes the heavy lifting out of event staff management! You have several events/activities coming up that you need to deploy staff to. Deadlines are looming. The pressure is high. Grab a chair. Put your feet up. 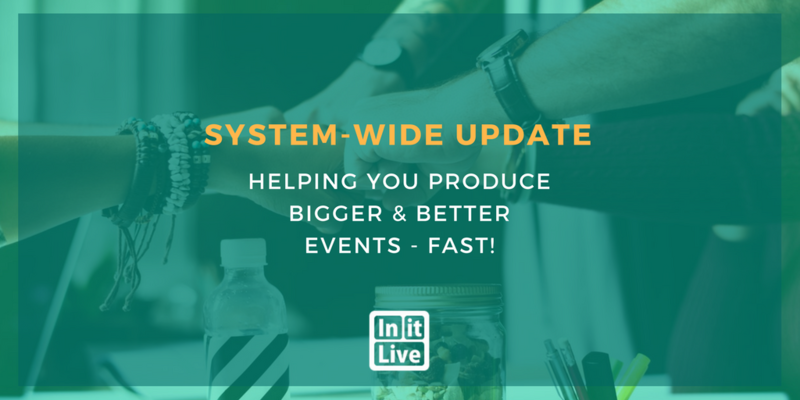 Because these GIANT updates to the InitLive system are about to relieve you of all your staff & volunteer management burdens! From seamless staff onboarding to detailed self-serve reports, efficiency and growth are our goals for you & your team. Yes! InitLive now has a universal portal for all managers and staff. Have full confidence over what your staff are seeing because both managers and staff now land on the same homepage upon login. The information users see will be based on the organizations and events they are part of as well as their permissions. Have staff who you know will work your events later this year, but not just yet? Perhaps you want to recruit all year round for all of your events? Use InitLive to build an organization level staff list that isn’t tied to any events. 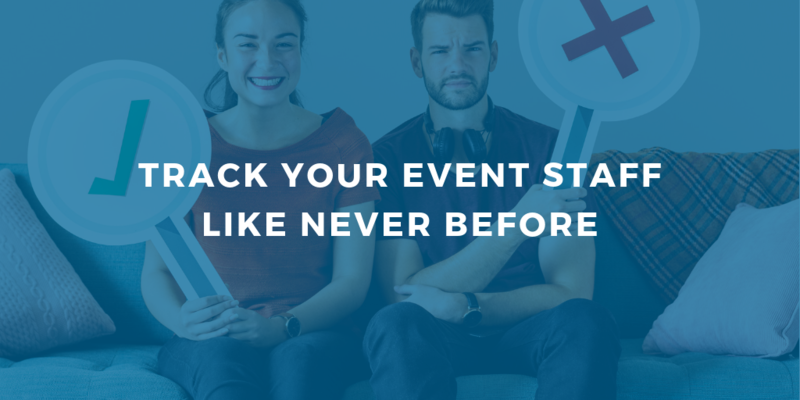 When you’re ready, start adding them to events - fast! Event requirements vary, so having a highly configurable tool couldn’t be more important. Achieve greater flexibility over your events and data through bulk actions and the ability to control permissions, visibility, sign-up workflows, staff minimums and maximums per shift or event, email communications & more. This applies to the InitLive mobile app too - toggle your settings to go ‘LIVE' - activating the app - anytime. Let’s face it, your managing team never has time to be buried with volunteer inquiries. Staff will now be carried through your custom signup workflow and prompted to fill out your required questions. After staff have signed up for shifts, they can easily download their schedule to have on file. With this new and intuitive process, stay focused on your event priorities, experience rapid staff onboarding, an increase in signups and a focused inbox. Sometimes certain applicants just don’t make the cut. Develop a high-quality Organization Staff List by vetting staff using InitLive’s new applications feature. When you need to reject applicants, you can also send them a personalized message to let them know why/what their missing requirements are. Rejected applications then go into a separate list for you to refer to just in case you change your mind. In general, having staff who are double-booked is bad news! Toggle your settings to prevent staff from belonging to overlapping shifts. When staff are selecting their own shifts, they will be instantly notified and prevented from double-booking themselves. Introducing public event listings that you can make visible to all staff within your organization. So, when your staff login, they will be able to browse through your upcoming public listings and sign-up if registration is open! Better yet, staff will not need to re-input information that has already been collected from them. Hooray for enabling staff to be proactive and do more! He said, she said...Ever wonder what was said on-site? Get ready to unveil communication patterns of managers and staff with the new Communications report. This report includes all messaging that was exchanged, via the InitLive mobile app, paired with timestamps. Leverage this data to keep a "paper trail" for liability purposes, stay accountable, look for areas to improve, see how emergencies were handled, and remember why certain things happened. After each of your events, generate a check-in / check-out log at the click of a button. This will provide you with an exact timestamp for the comings and goings for every staff member. Use this information to track volunteer hours or for payroll purposes. What are you waiting for? 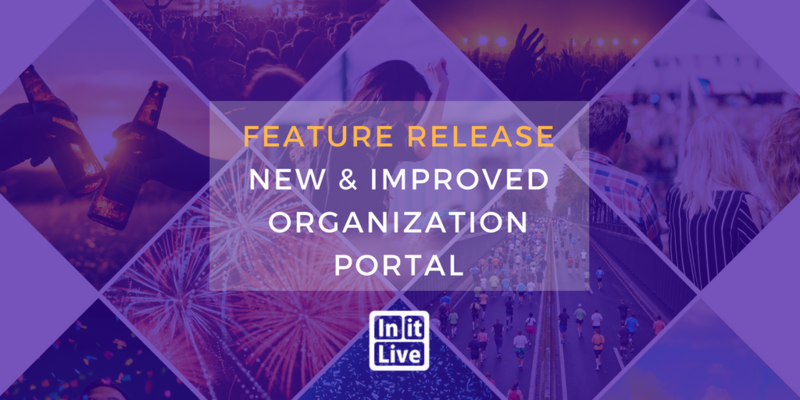 Go log in and check this new portal out, or watch a demo to see how InitLive takes the heavy lifting out of staff scheduling and communication! Imagine a mission control board for event producers, their staff, and their extensive list of upcoming events - where you can deploy select staff/volunteers from your database across countless events and where you can view dashboard insights on your recruitment progress. Now stop imagining because... it's here! The new Organization Portal just had a massive facelift! Here are some of the features and functionalities you won't want to miss! Have staff and volunteers who you plan to schedule out across several events throughout the year? Upload your staff database to the new Organization Portal or have staff sign-up through your Organization registration page. With this process, your staff will be thrilled that they only need to register once, no matter how many events they plan/hope to be a part of. Less steps for them, and best of all, more control for you! We understand. When you have a ton of events to manage, it can be dizzying to monitor the status of each one. Using the new Organization Portal, you can access a dashboard to view how many staff you have - within your organization, and within each of your events. From here, you can also see at a glance how many events are live, upcoming, and past - as well as your InitLive inventory, so that you can always keep track. From the Organization portal, adding staff/volunteers across multiple events is easy using the bulk actions tool! 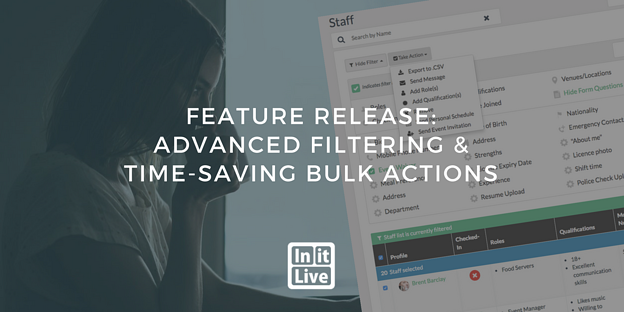 Use InitLive's advanced filtering options to find the staff you need and, with only a couple clicks, you'll be able to add those staff to as many events as you like. What are you waiting for? Go log in and check this new portal out, or watch a demo to see how you can deploy staff to your year's worth of events in a matter of minutes! Have you ever been so excited, you nearly hyperventilated? We hope you have because it’s a pretty great feeling. Allow us to explain why so that you can share some of this joy with us. The past few months have been full of great updates: including 50+ product updates, 3 new partnerships, disaster relief outreach projects, and 3 new languages, to name a few. 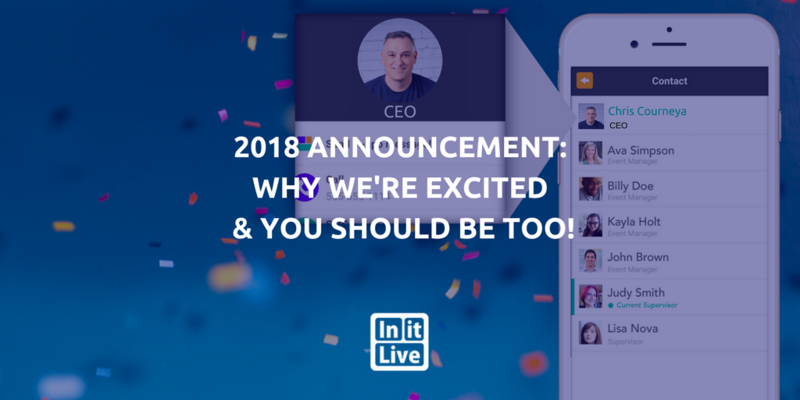 There has been tremendous growth in the company - InitLive’s user-base has increased by 157%, the number of events run using InitLive software has increased by 80%, and the product is being used by 26 countries and counting. Why does this have us so excited? Because we’re determined to serve our customers - YOU! - in the best way possible, and with every new update, we’re getting closer. The InitLive family is growing! We would like to introduce you to Chris Courneya, a talented leader who has tons of experience in streamlining company processes to optimize for growth. Chris has been appointed as our new CEO! With his leadership he intends to implement speedy product development, build key partnerships and so much more - with the end goal of empowering our customers. For more details on our CEO announcement, please check out our press release here! This year, we were pleased to introduce customizable registration pages. As part of the recruitment phase, event organizers can use InitLive’s foolproof editor for uploading their own profile photo and cover image to their registration page - a simple, yet powerful way to convey event personality/brand to onlooking volunteers. With this update came more flexibility than ever before for staff and volunteer recruitment. Event managers can now set-up and customize all of the questions within a registration form - asking anything from t-shirt size to dietary restrictions to availability and more. This registration form can be used as an application for an event or as a gateway to shift sign ups. This year, we partnered with three great companies. This has opened doors to further product integrations and enhancements in order to meet the expanding market and customer needs. 4) Your On-Site Assistant is Getting Smarter Every Day! 2017 was a great year for the InitLive event day app. A brand new dashboard was created for Supervisors and for Check-in administrators to easily check-in-and-out staff. Shift titles and role descriptions became visible to staff and managers for increased visibility and accountability. AND, event managers can now access all custom question data on their volunteers directly from the app. This past summer, we were honored to support thousands of volunteers helping with Hurricane Harvey and Irma relief efforts through the use of InitLive’s web and mobile app. This was a year of optimization for data-loading times. No matter how large your staff list is, no matter what report you need to export, and no matter how much data you copy over, our developers made a series of updates to make page-load times as quick as possible to help you maintain a Speedy Gonzales planning pace. Once it’s showtime, communication becomes more important than ever before. InitLive’s messaging and notification functions had some facelifts to help optimize this area! Via the app, all users can quickly reply to messages sent to them, staff can message managers/multiple people, and managers can broadcast to entire shifts or filtered staff lists. InitLive Registration Forms got way more powerful. Now, every time you create a custom question on the Registration Form, a custom filter "auto-magically" appears on your staff list to help you find/filter through that information easily. Filter by t-shirt size, dietary restrictions, availability and more - the sky’s the limit! We know how precious and limited your time can be. That’s why we were pleased to give you even faster ways to set your event up in InitLive. 2017 presented ‘Bulk Actions’: Select specific staff from our staff list or ‘select all’, and add roles and qualifications in bulk. Raindrops on roses, and whiskers on kittens. Innovative technology and customer-driven enhancements. 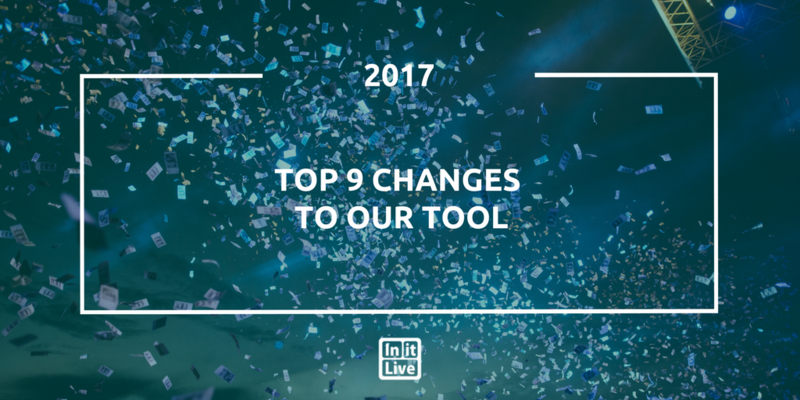 InitLive's new advanced filtering options and bulk action functionality will have you singing by the end of this post! InitLive Registration Forms just got way more powerful! Why? Because, now, every time you create a custom question on the Registration Form, a custom filter "auto-magically" appears on your staff list to help you find/filter through that information easily. For example, should you create an "Availability" question for your volunteers to fill out, you will now be able to filter to see which staff checked off specific time slots directly within the InitLive portal. InitLive's new advanced filtering technology supports all question types within your Registration form. Whether you're using drop-down questions, multi-select, date pickers or photo/document uploads, our filters allow you to find the responses you're looking for. Just when you thought you might be able to stump our filtering features, you didn't! 😂 InitLive's new filtering allows you to drill-down on questions that have sub-questions (i.e. Question: Are you available on Day 1? Sub-Question: If so, which time slot?). In just one click, filter by this sub-question to see which staff are available during specific time slots on Day 1. Setting up your staff and communicating just got lightning-fast! 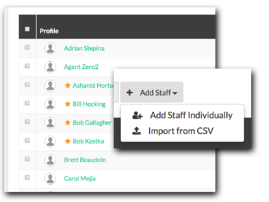 Whether you've filtered your staff list or not, select multiple (or all) staff to perform a variety of bulk actions. Select multiple staff and assign any number of Roles to those staff. You guessed it! Select multiple staff and assign any number of Qualifications to those staff. Apply all the necessary Roles to your shifts in just a few clicks! No matter how many custom questions you've created, access all of this valuable volunteer data from the app on event day! For a personalized demonstration of these features and more, get a demo! Be the first to know about product updates! At InitLive it is our mission to recruit, organize, and connect staff and volunteers, who we believe are the foundation of a great event.